I went rock climbing two months ago near New Paltz, NY, about an hour and a half north of NYC. Well, the intention was to go climbing anyway. What actually happened consisted more of scenic routes, collecting acorns, pretending to be hung by a rope (would also have ended up in email forwards had it gone badly), and a lot of staged photo opportunities than actual rock climbing. There were three of us, one of whom was camera-happy. I like having camera-happy people around. It means adventures get documented. I almost always forget to take pictures. The problem is when the person with the camera slows everyone down. Which is what happened on this particular climbing expedition. Naturally, we got sick of waiting. So we started exploring the rocks. I found a large, pitch-black cave that needed exploring. Except it wasn’t really a cave. It was just a bunch of massive rocks piled on top of each other that formed lots of dark crawl spaces. You know that feeling where you know your mother probably wouldn’t approve of what you’re about to do, but you know you’re going to do it anyway? Yeah, me too. This particular hole in the pile of massive rocks didn’t turn out as exciting as we’d hoped: no endless rabbit hole, no dead bodies. It didn’t even stay pitch-black for very long. All it did was go up. The problem was that it looked a bit too risky to go up, as did going back down the way we had come (not to mention that admitting defeat would be disastrous to my inner mountain man pride). I managed to find a crawl space that looked just big enough for someone slightly smaller than myself. Maybe I can get out this way! Either that or it’ll dead-end in an impossible to get out of hole? Awesome. I laughed, agreed, and continued on my way, but then noticed my brain trying to freak out. I don’t get claustrophobic, but my mind/body/conscience/whatever was trying to tell me I should. Ridiculous. I’m not claustrophobic. I’m not really in any danger. That’s what I told myself. And it worked. Sure, I couldn’t actually turn my head, or take deep breaths in some spots due to the lack of space between the rocks, but whatever. Who needs breathing room as long as the way ahead appears to offer a way out? Well, it may have, but the chance of getting stuck looked better than the chance of escape so I gave up and wriggled back out. Anyway, the point of this is that, while what I was doing wasn’t necessarily the most rational thing to do, listening to fears after getting into the mess would have been more irrational than the original irrationality. The next time you get yourself into a sticky situation and you feel yourself trying to panic, don’t. It doesn’t help. OK this was a little weird to read after all the recent news about the Nutty Putty Caves. Ryan December 14, 2009 at 3:59 PM I had no idea that had happened until I read an email from my mom this morning. That’s very sad and will definitely make me more cautious going forward. I never went to nutty putty caves, though I did go spelunking in similar caves in Kentucky once. NatAttack December 14, 2009 at 5:36 PM This makes me nervous just reading. WHOA!!! I got scared and claustrophobic for you! 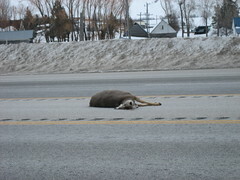 You know all about dead deers crossing the street too! Is that a picture from when you ran into that deer? Ryan December 16, 2009 at 8:35 AM Yes, that is the deer I hit!